ADOT has been a front-runner in utilizing and embedding INVEST throughout the full lifecycle of its transportation services, including administration, project planning, design, construction, and systems operations and maintenance. INVEST has also been a keystone in the development of the agency’s Sustainable Transportation Program. ADOT’s first annual Sustainable Transportation Program Report, The Collaborative Benefits of Using FHWA’s INVEST (June 2015), presented the agency’s initial experience with sustainability tools, as well as their progress in using the Project Development (PD) and Systems Planning (SP) modules of INVEST. Their second annual report, Operationalizing Sustainable Transportation and FHWA’s INVEST Operations and Maintenance Implementation (April 2016), details how the agency has made great strides in operationalizing INVEST, and how ADOT evaluated the sustainability of their operations and maintenance processes. This case study focuses on ADOT’s use of the Operations and Maintenance (OM) module. To read more about ADOT’s use of the INVEST PD module, check out ADOT’s Using INVEST to Integrate Sustainability Case Study. Building off of its prior use of the SP and PD modules and the successes achieved from those evaluations, ADOT used the INVEST OM module in 2015 and 2016 to assess both internal operations, specifically the Facilities Management and Equipment Services Divisions, and infrastructure, operations, and maintenance areas using the 14 OM module sustainability criteria. The ADOT project team facilitated scoring workshops for each of the 14 OM module sustainability criteria. At each of the hour-long workshops, the project team consulted with one to five of the most senior ADOT subject matter experts to review and score the given criteria. At the culmination of these 14 workshops, ADOT scored 142 points out of a possible 210 points (see the table below), achieving an INVEST Platinum rating. ADOT took an extra step by converting their scoring assessment from INVEST Version 1.1 to Version 1.2, resulting in an additional three points and bringing ADOT’s total score to 145 points. The flexibility built into INVEST allowed the scoring team to easily review criterion changes and adjust their scoring from Version 1.1 accordingly. In ADOT’s experience, the changes between Version 1.1 and Version 1.2 were minor, only affecting OM-12. The table below reflects ADOT’s revised scored based on INVEST Version 1.2. OM-3 Vehicle Fuel Efficiency and Use (15/15). ADOT has a Fleet Management Plan that includes goals for maximizing fuel economy for light- and heavy-duty fleets rather than instituting consumption goals, and measures progress and fleet performance. The agency also conducted an alternative fuel vehicle study in 2012, but found that such vehicles were not operationally or fiscally viable at the time. ADOT is projected to add a limited number of electric/hybrid vehicles to the fleet plan. OM-7 Pavement Management System (15/15). 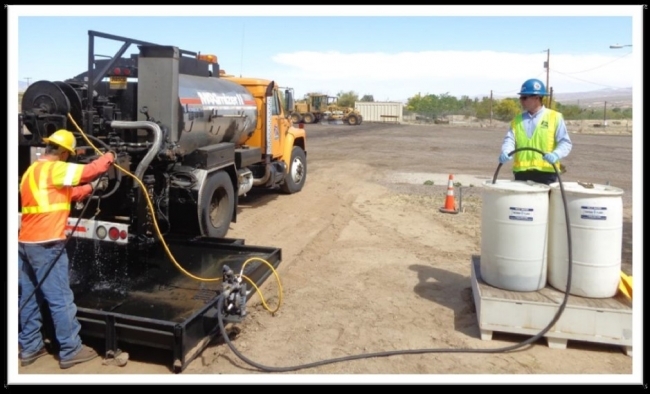 In addition to achieving all of the elements within this criterion, ADOT established the Quiet Pavement Program in 2003 after determining that rubberized asphalt greatly helped with noise abatement and reducing the disposal of used tires. The agency also hopes to collaborate with FHWA to pilot a selection of suggested sustainable practices, through the 2017 rollout of ADOT’s Black & Green Sustainable Pavement Systems Program, including an Ultra-Thin Bonded Overlay in areas with high turning movements. OM-13 Transportation Management and Operations (15/15). In addition to achieving all of the elements within the criterion, ADOT launched a new Transportation System Management and Operations (TSMO) division in October 2015. This division will take the lead for ADOT in Traffic Incident Management, Incident Corridor Management, Emergency Management, Signal System Coordination, and Connected and Automated Vehicles research and implementation. OM-14 Work Zone Traffic Control (15/15). ADOT has a very comprehensive Work Zone Traffic Control program, an established metric for work zone crashes of “zero tolerance”, and has monitored progress towards this goal for the last 7-8 years. Furthermore, ADOT uses intelligent transportation systems to keep travelers informed of construction and conducts regular outreach to property owners affected by construction. OM-1 Internal Sustainability Plan (4/15). ADOT earned only four points for this criterion as the agency does not have a Comprehensive Internal Sustainability Plan (CISP), conduct sustainability training, or provide support for alternative fuel vehicles used for commuting. Based on ADOT’s INVEST evaluation, the Sustainable Transportation Program is recommending that the Agency adopt a CISP, provide sustainability-related training to help the agency execute the CISP, and provide support for alternative fuel vehicles used by commuting ADOT employees. OM-2 Electrical Energy Efficiency and Use (8/15). While ADOT was able to achieve 8 points for this criteria, the agency fell short of achieving a higher score since it does not have a goal for buying Renewable Energy Credits (RECs) or a renewable portfolio standard, nor does it have renewable energy usage goals, an Employee Energy Reduction Committee, or a renewable energy goal. To address these issues, ADOT proposes to develop a consolidated energy efficiency and use plan that includes goals for renewable energy usage and/or credits and addresses the energy reduction of ADOT facilities. Additionally, ADOT seeks to establish an Employee Energy Reduction Committee to promote energy savings. Informal energy reduction efforts over the last ten years already resulted in a verified $800,000 in savings. OM-6 Environmental Commitments Tracking System (0/15). This was the only criterion where ADOT achieved zero points as the agency does not have a formal comprehensive Environmental Compliance Tracking System (ECTS). Instead the agency uses multiple systems to comply with State and federal requirements each year. ADOT recognizes the need to comprehensively define what it needs to track for environmental purposes and integrate this tracking into its existing processes. As such, ADOT recommended developing a formal ECTS. Since the completion of ADOT’s evaluation, a new environmental commitments tracking effort reflecting better integration with ADOT’s road and bridge construction standard specifications is underway. Additionally, ADOT is continuing to reengineer the environmental planning area including a brand new FHWA Arizona Division Office Programmatic Categorical Exclusion (PCE) agreement. OM-8 Bridge Management System (8/15). Although ADOT has a Bridge Management System (BMS) software and the ability to track project timeliness with the software, it has not yet done so. Though ADOT set a bridge system performance goal, it does not meet the INVEST subrequirement of monitoring progress toward achieving this goal. The agency has not yet used its BMS to perform sophisticated modeling (though they are in their first year of data collection). Finally, ADOT does not yet leverage life-cycle cost analysis (LCCA) to predict project life cycle costs. To maximize its score on this criterion in the future, ADOT put forth a recommendation to continue using recently acquired BMS software to track project timeliness. The BMS should also leverage newly collected data to perform scenario analyses, trade-off analyses, and other modeling practices, as well as, perform life-cycle cost analysis to predict costs and forecast budgets. ADOT anticipates taking next steps to meet this requirement once two years of data have been collected and integrated into the system. OM-12 Road Weather Management Program (6/15). ADOT does not currently have a Road Weather Management Program or a Materials Management Plan, so it was limited in the number of points it could achieve for this criterion. Moving forward, ADOT aims to develop a formal Road Weather Management Plan with quantifiable metrics and measure progress toward those metrics as well as implement a formal Materials Management Plan for road weather management purposes. Additionally, ADOT would like to develop formal level of service metrics for storm performance and measure progress. INVEST is a core element of ADOT’s Sustainable Transportation Program. Through the use of INVEST and its different modules and building off the outcomes of INVEST evaluations, ADOT has been able to expand its knowledge of current and evolving sustainability best practices, move its Sustainable Transportation Program and related activities forward, and foster intra-agency collaboration. The INVEST scoring process helped ADOT identify gaps in current OM sustainability practices that present opportunities for potential improvement. As a result, ADOT developed eight internal recommendations, six maintenance recommendations, and eight operations recommendations to improve OM practices. Having been involved with INVEST since the beginning (through beta testing and piloting the tool) as well as conducting subsequent INVEST evaluations, ADOT has provided vital feedback to FHWA in identifying ways to improve INVEST and ensure that the tool continues to evolve in order to better reflect and capture new and emerging best practices.